Business analytics (BA) allow us to learn from the past and make better prediction for the future. There are three types of analytics used for the learning from the Past. Descriptive analytics summarizes historical data; exploratory analytics uncovers hidden patterns and explanatory analytics reveals the reason for business results. WE describes Big Data as “a term that describes the large volume of data – both structured and unstructured – that inundates a business on a day-to-day basis.” What’s important to keep in mind about Big Data is that the amount of data is not as important to an organization as the analytics that accompany it. When companies analyze Big Data, they are using Business Analytics to get the insights required for making better business decisions and strategic moves. Lead multiple analytical projects and business planning to assist Leadership team deliver business performance. It can be termed as the study of business data using statistical techniques and programming for creating decision support and insights for achieving business goals. We use statistical techniques and programming by using only business data and not the entire data for Business Analytics. It’s based on analytical tools like R, SAS, SPSS data. Business Analytics is an important activity in an organization in order to create decision support and get an insight. It will help businesses to achieve their goals. It typically enhances the marketing team to channelize their efforts. What do you use to help you make decisions? Is it information or data? If you had more of it, would you make better decisions? Probably, yes. The same is true for businesses. Businesses use data to help them make the best decisions possible. They use structured and unstructured data, and lots of it. But it’s not enough to have the data; businesses have to know what to do with it – they have to know how to analyze the data they acquire. Businesses use business analytics to analyze the data they have accumulated in order to make decisions. Business analytics is the statistical analysis of the data a business has acquired in order to make decisions that are based on evidence rather than a guess. This is called data driven decision making. Making decisions based on data allows businesses to operate more efficiently, and the more data based decisions they make with positive results, the more they can simplify the process by coming up with formulas for the future. For example, when we do ‘A’, ‘B’ happens 90% of the time and that’s the result we want, so let’s do ‘A’ again. 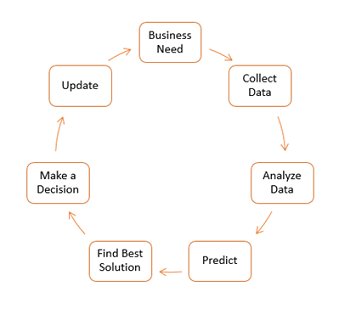 Some examples of using business analytics include finding patterns and relationships between processes and outcomes, explaining why a result was achieved, determining if a previous decision was appropriate, or predicting the likelihood of a particular result happening. Analytical Customer Relationship Management (CRM): BA can be applied to analyze a customer’s behavior across the customer lifecycle i.e. (acquisition, relationship growth, retention, and win-back). A lot of business analytics applications such as Direct Marketing, Cross-Sell, Customer Churn and Customer Retention are components of a well-managed Analytical CRM. Predictive analytics forms the backbone of this CRM and is applied to customer data to create a holistic interpretation of the customer after collating information across all departments and locations. Fraud Detection:Fraud is now a pervasive problem and can come in various forms: intentionally inaccurate credit applications, fraudulent transactions (both offline and online), identity thefts and false insurance claims, to name a few. These problems hence affect credit card issuers, insurance companies, retail merchants, manufacturers, business-to-business suppliers and even services providers. A predictive model can help an analyst distinguish specious data/transactions from other similar data and reduce exposure to fraud. For instance, the Internal Revenue Service (IRS) of the United States uses predictive analytics to mine tax returns and identify tax fraud. Forecasting and Inventory Management : Retailers are typically interested in predicting store-level or sector-level demand for inventory management purposes. Similarly a manufacturing firm may be interested in predicting GDP figures to analyze demand and hence level of production. Both Forecasting and Machine Learning approaches can be used to find patterns that have predictive power. Underwriting : Insurance providers need to accurately determine the premium charge for all assets ranging from automobiles and machinery to people. Similarly, Banks need to assess a borrower’s capability to pay before agreeing to a loan. Business Analytics can analyze past data, to predict how expensive an applicant or an asset is likely to be in the future. Human Resource Department: Business Analytics is used by human resources (HR) departments to create a profile of their most successful employees. Details – such as universities attended or previous work experience of successful employees – can help HR focus recruiting efforts accordingly. Market Basket Analysis: Market Basket Analysis finds association rules within transaction-based data. It has been used to identify the purchase patterns of the High – Volume Consumer. Analyzing the data collected on this type of customer has allowed companies to predict future buying trends and forecast supply demands. Numerous Other Applications: Credit – Scoring Analytical Models reduced the amount of time it takes for loan approvals to a few hours rather than days or even weeks. Pricing Models can lead to optimum pricing decisions, which can help mitigate risk of default. Analytics specifically, Pattern Mining and Subject Based Data Mining has even been used to counter Terrorism. First the business will determine what it is that they need, or what their goal is for collecting the data. Next they’ll collect the data. This could be structured data like customers’ demographics (age, gender, political affiliation, etc. ), or unstructured data like feelings about customer service. Once the data is collected, it is analyzed. If the goal was to find out the average age of customers who bought a particular project, the business would do a statistical analysis, perhaps using a spreadsheet to perform the calculations. Based on the analysis of the data, the business can make certain predictions. For example, if they find the average age for their customer is 25, they can predict that if they target their marketing campaign to that demographic they will increase their sales. The analysis of the data may have suggested more than one viable route that will meet the business’ need or goal. These need to be evaluated to find the one that best meets their need. Once the best solution has been found, it must be acted on – someone in the business needs to follow through and take action. The final step – well, almost the final step – is to evaluate the effectiveness of the decision and update the information the business has access to. This evaluation generally leads back to the first step where the business decision makers can use the information acquired and analyzed for an initial need to determine what other needs the business may have. Business Intelligence (BI) and Business Analytics are similar, though they are not exactly the same. Business Intelligence involves the process of collecting data from all sources and preparing it for Business Analytics. Business Intelligence is more of a first step for companies to take when they need the ability to make data-driven decisions. Business Analytics, on the other hand, is the analysis of the answers provided by Business Intelligence. While Business Intelligence answers what happened, Business Analytics answers why it happened and whether it will happen again. Business Intelligence includes reporting, automated monitoring and alerting, dashboards, scorecards, and ad hoc query; Business Analytics, in contrast, includes statistical and quantitative analysis, data mining, predictive modeling, and multivariate testing. Explainability vs. the “Perfect Lift” – Balance building precise statistical models with being able to explain the model and how it will produce results. SAS – SAS continues to be widely used in the industry. Some flexibility on pricing from the SAS Institute has helped its cause. SAS continues to be a robust, versatile and easy to learn tool. SAS has added tons of new modules. Some of the specialized modules that have been added in the recent past are – SAS analytics for IOT, SAS Anti-money Laundering, and SAS Analytics Pro for Midsize Business. Tableau – Tableau is an easy to learn tool that does an effective job of slicing and dicing your data and creating great visualizations and dashboards. Tableau can create better visualizations than Excel and can most definitely handle much more data than Excel can. If you want interactivity in your plots, then Tableau is surely the way to go. Excel – Excel is of course the most widely used analytics tool in the world. I have seldom come across a data scientist who does not use Excel. Whether you are an expert in R or Tableau, you will still use Excel for the grunt work. Non-analytics professionals will usually not have access to tools like SAS or R on their machines. But everyone has Excel. Excel becomes vital when the analytics team interfaces with the business steam. QlikView – Qlikview and Tableau are essentially vying for the top spot amongst the data visualization giants. Qlikview is supposed to be slightly faster than Tableau and gives experienced users a bit more flexibility. Tableau has a more intuitive GUI and is easier to learn. Splunk – Splunk is more popular than some of the more known names like Cloudera and Hortonworks. It started as a ‘Google for log files’ which means its primary use was to process machine log files data. It has now become much more than that. Splunk has great visualization options and a web interface makes it easy to use. Business analytics tools are types of application software which retrieve data from one or more business systems and combine it in a repository, such as a data warehouse, to be reviewed and analysed. Most organisations use more than one analytics tool, including spreadsheets with statistical functions, statistical software packages, sophisticated data mining tools and predictive modeling tools. Together, these business analytics tools give the organisation a complete overview of the company to provide key insights and understanding of the business so smarter decisions may be made regarding business operations, customer conversions and more. While business intelligence tools also collect and display aggregate data, business analytics tools go a step further to not only report the results of the data, but explain why the results occurred to help identify weaknesses, fix potential problem areas, alert decision makers to unforeseen events and even forecast future results based on decisions the company might make. This gives organisations the understanding and confidence to achieve business goals, keep the company competitive and increase overall customer satisfaction. By having a company, as an investor or an entrepreneur you need to know what you are getting yourself into. You need to have all the data to back up your goals and visions for the company. We should always keep asking ourselves, if it even makes sense to make this particular move. For this reason, you need to do a Business Analysis. You check for profits. If the market shows signs of return on investment you will be encouraged to invest. Similarly if the market isn’t profitable then you will not make the move. By analyzing, you try to understand the customers. You try to find out what it is that they want or the problems they have. Then, we try to provide them with that exact product or services that caters to them. Business analytics is a methodology or tool to make a sound commercial decision. Hence it impacts functioning of the whole organization. Therefore, business analytics can help improve profitability of the business, increase market share and revenue and provide better return to a shareholder. Facilitates better understanding of available primary and secondary data, which again affect operational efficiency of several departments. Provides a competitive advantage to companies. In this digital age flow of information is almost equal to all the players. It is how this information is utilized makes the company competitive. Business analytics combines available data with various well thought models to improve business decisions. Converts available data into valuable information. This information can be presented in any required format, comfortable to the decision maker. Business analytics has been existence since very long time and has evolved with availability of newer and better technologies. It has its roots in operations research, which was extensively used during World War II. Operations research was an analytical way to look at data to conduct military operations. Over a period of time, this technique started getting utilized for business. Here operation’s research evolved into management science. Again, basis for management science remained same as operation research in data, decision making models, etc. As the economies started developing and companies became more and more competitive, management science evolved into business intelligence, decision support systems and into PC software. Business analytics has a wide range of application and usages. It can be used for descriptive analysis in which data is utilized to understand past and present situation. This kind of descriptive analysis is used to asses’ current market position of the company and effectiveness of previous business decision. It is used for predictive analysis, which is typical used to asses’ previous business performance. Business analytics is also used for prescriptive analysis, which is utilized to formulate optimization techniques for stronger business performance. For example, business analytics is used to determine pricing of various products in a departmental store based past and present set of information. Business analytics uses data from three sources for construction of the business model. It uses business data such as annual reports, financial ratios, marketing research, etc. It uses the database which contains various computer files and information coming from data analysis. Business analytics can be possible only on large volume of data. It is sometime difficult obtain large volume of data and not question its integrity. Thank you for taking the time to read our book and we hope you enjoyed reading it as much as we did writing it. To illustrate the applications of analytics to answer many critical business questions, a list of top 10 questions in every area of business was discussed. Within each question, ways of applying analytics were also suggested. The vital lessons learned in more than a decade of applying analytics in businesses were also shared. To avoid the common trend of investing in analytics without using it, pitfalls were also highlighted based on the author’s own experience. The main lesson is to tightly link analytics to business. To do this, you have to create safe and productive intersections staffed by analytics deciders who are well-versed in both business and analytics, supported by an analytics sandbox as part of the holistic BAP. Hii sir very nice article..mera ek que hai ki jo aapne tead in your language ka menu lagaya h wo kis tarah se lga sakte hai ki hum kisi bhi language me post read kr sake plz suggest me..
Sir suru ke do word me very nice article likha hu something wrong type ho gaya.Aapne explain bahut acha kiya hai..